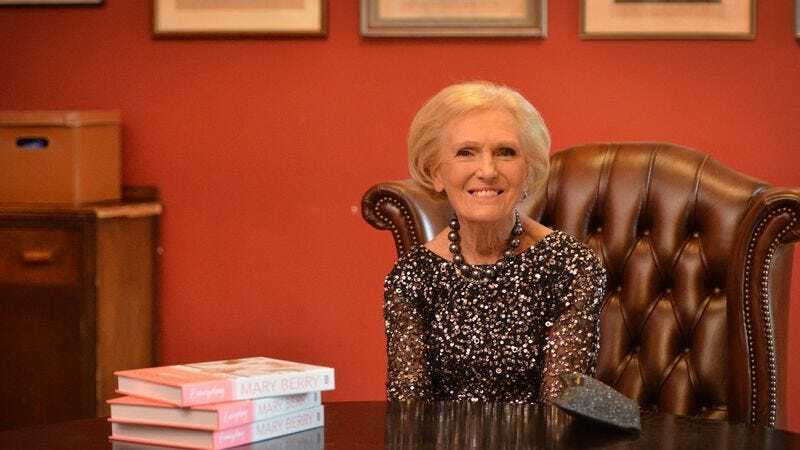 The great Great British Bake Off schism continues, with the BBC announcing today that former judge Mary Berry—who declined to follow the massively popular cooking series when it was acquired by Channel Four last year—will soon be hosting her own competitive cooking program. Tentatively titled Britain’s Best Cook, the BBC One series will see Berry—an accomplished author of more than 75 cooking tomes, and one of the world’s most talented deployers of the adjective “scrummy”—branching out of baking and into the wider world of food. The series will pit 10 amateur chefs against each other, as they genteelly battle it out for the show’s titular title. “I am never more at home than when I have my judging hat on,” Berry said, not even deigning to mention that old show, or her former co-worker, silvery glowering bread man Paul Hollywood. “This series is going to encourage proper home cooking which I have always championed and I cannot wait to start.” No word yet on whether former GBBO presenters Mel Giedroyc and Sue Perkins will similarly soon be launching a cooking series of their own, entirely built on bread-based puns for dicks and butts.